Slide Them Over a Doorknob for Keys and More! These charming hanging pockets are handy just about anywhere around the house for storing little things that are easy to lose. Hang one on a doorknob or hook to provide a pretty accent as well as easy storage. Stiff interfacing (Pellon 809 Décor-Bond) allows them to hold their shape. That makes it easy to drop things into the pockets and to retrieve them. Choose beautiful fabrics, or even piece a section of patchwork to create a pocket from. Since they’re reversible, choose two fabrics that work nicely together. 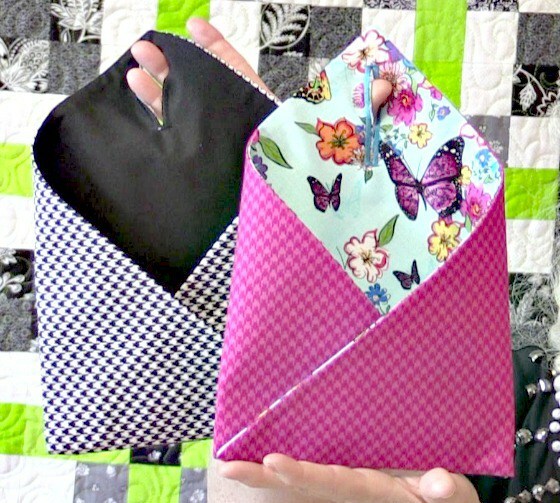 The envelop shape is very easy to put together, starting with 16 1/2″ fabric squares. 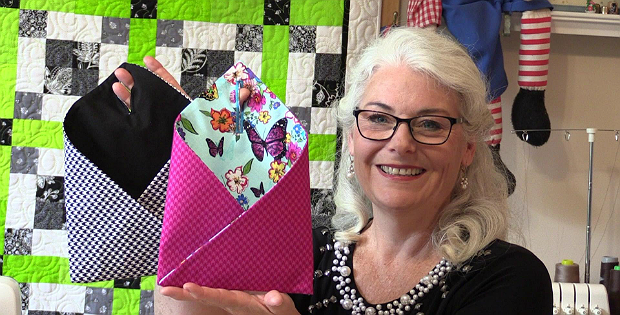 Laura from Sew Very Easy shows you how in the following video. Love, love, LOVE this!! Makes a great project for kids to work with also! thank you! LOVE this project… great ideas. Love this! Not complicated and can use my scraps! Thank you. I can see these would be so great on my sewing room bulletin board, as well. What a CLEVER IDEA!! Thanks for sharing! I’m recently retired and now have time to see therefore I enjoy your videos. How cute. They could also be use for Thanksgiving and Christmas to hang on your neighbor/friend door with a small gift inside. It would be a surprise. Great ideas. Looking forward to more.